ORLANDO, Fla. – Brad Kaaya overcame a slow start to throw four touchdown passes to help lead Miami to a 31-14 win over No. 14 West Virginia in the Russell Athletic Bowl on Wednesday night. Ahmmon Richards, Malcolm Lewis, and Braxton Berrios each caught touchdown passes for Miami during a pivotal six-minute span in the second quarter. David Njoku also caught a touchdown pass. It was the first bowl win for Miami since 2006 ending a six-game losing streak. Miami (9-4) won five consecutive games to end the season, which is the longest winning streak to end a season since the 2001 team went undefeated at 12-0. Mark Richt’s first year at Miami could end with a team that is ranked in the final AP Poll for the first time since 2009 when the Hurricanes finished 19th. Miami is 17-3 all-time against West Virginia (10-3) as the two former Big East schools met for the first time since 2003. It was potentially the final game at Miami for Kaaya, who completed 24 of 34 passes for 282 yards, as the junior is Miami’s all-time leading passer. Kaaya is expected to enter the NFL Draft a source has informed InsideTheU. Underclassmen have until Jan. 16 to announce their intentions. Kaaya started 5 of 13 for 29 yards before completing his next 10 passes including three for touchdowns. He completed 19 of his last 21 passes. West Virginia picked off Kaaya twice, but the interceptions were overturned due to defensive pass interference calls. West Virginia quarterback Skyler Howard passed for 163 yards and rushed for 63 yards and a touchdown. Njoku’s 23-yard touchdown in the third quarter pushed Miami’s lead to 28-7. Njoku caught a pass along the Miami sideline and broke a tackle on his way to the end zone in what could be his final catch at Miami as he is also expected to leave for the NFL Draft. Howard cut the West Virginia deficit to 28-14 with a short touchdown run. Miami responded with a 30-yard field goal by Michael Badgley for a 31-14 lead. Miami outgained West Virginia 364-266 in total yards as Corn Elder led the Hurricanes with seven tackles. Five players combined to record four sacks. Both teams took turns struggling in the first half with Miami behind held to 19 yards without a first down in the first quarter and West Virginia had just 17 yards without a first down in the second quarter. West Virginia was in control early in the game and eventually broke through on its third drive of the game with a 6-yard touchdown run by Kennedy McKoy following a 24-yard run by Howard. The Mountaineers appeared to have the upper hand throughout the first half, but could not build on their 7-0 lead. Meanwhile, the Hurricanes struggled mightily gaining just 40 yards on their first 21 plays. Then, the Hurricanes woke up scoring three touchdowns in six minutes, three seconds to take a 21-7 lead into halftime. Richards sparked the Hurricanes with a 51-yard touchdown reception using his speed to cross the field after a short pass and going in for the score. It was the third touchdown of the season for the freshman All-American. Miami used the momentum from Richards’ game-tying touchdown by getting a stop and scoring on the ensuing possession going 59 yards on six plays including a 30-yard reception by Stacy Coley. Lewis’ 3-yard touchdown catch put Miami on top 14-7 with 2:11 left in the second quarter. 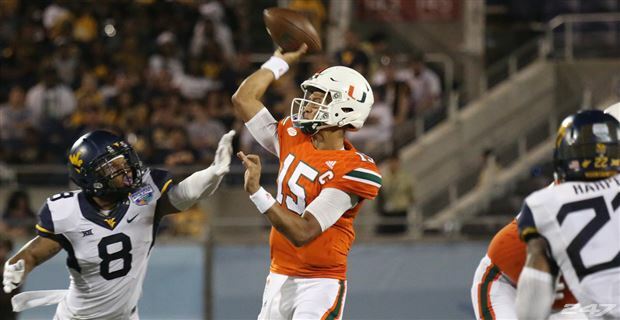 Kaaya took advantage of another drive before halftime completing all five of his throws including a 26-yard touchdown pass to Berrios into the end zone for one of Kaaya’s more impressive throws of the season.